The MyPark company's patented technology uses about a 4-foot-tall gate in the middle of the parking space which lowers after a driver engages the app. Would you pay for a better parking spot at the mall? Or just to get one at all? A Miami company is betting you will. MyPark is a rapidly expanding parking solutions provider used at some of the nation's best-known malls and by public and private garages and property management companies. The service is app-based, and a space can be booked on demand or reserved in advance for $3 for up to two hours and $3 each additional hour, though the first two hours appears to more expensive in some locations ($6 at the Mall of America in Minneapolis, for example). Shoppers who arrive early or need extra time can adjust setting via the app. 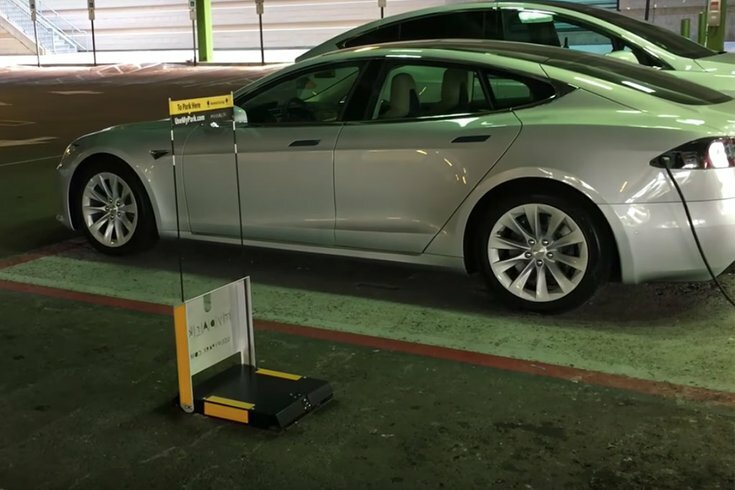 The company's patented technology uses about a 4-foot-tall gate in the middle of the parking space which lowers after a driver engages the app. Shoppers who are running late back to their cars can add extra time via the app. “Some people don’t like to relinquish their keys and cars,” said Mayendia, who launched the company in 2013 in Puerto Rico and is signing up two malls a month now. For now, it appears that no Philadelphia-area malls have installed the technology. The nearest is the Westgate Garden State Plaza in Paramus, New Jersey. In April the company raised $2.1 million in seed financing and plans soon to expand via franchising. The company is targeting airports and hospitals for expansion. It would certainly appear that pay-for-parking at the mall will be coming here soon. And maybe a lot of other places, too.